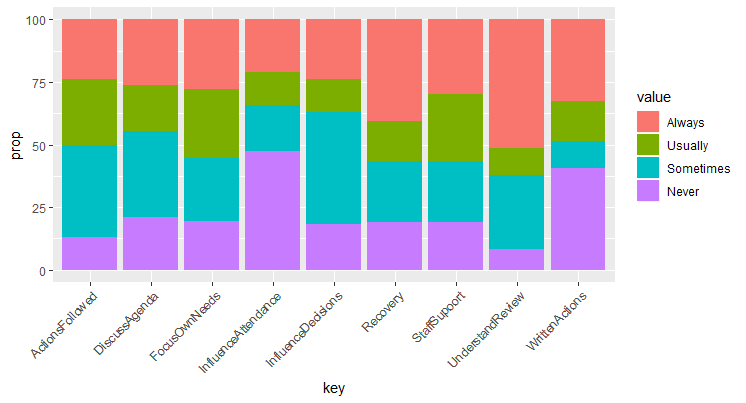 Don’t judge me, but I do spend quite a lot of time making stacked barcharts of survey data. I’m trying to go full tidyverse (see this blog, passim) and there is a very neat way of doing it in the tidyverse which is very easy to expand out into functions, or purrr, or whatever. Of course, me being me I can never remember what it is so I end up reading the same SO answers over and over again. So here, for all time, and mainly for my benefit, is the code to take a dataframe with the same Likert items over and over (in this case, Always/ Usually/ Sometimes/ Never) and find the proportions, change to percentages, make the x axis labels at an angle so they fit, put the stacking in the right order, and remove missing values. It’s pretty much completely generic, just give it a dataframe and the factor levels and it will work with any dataset of lots of repeated Likert items. That’s it! Don’t put any other weird “\n”s or [HTML line breaks which I now realise WordPress will interpret literally] in. You don’t need them! I’m pretty sure I’ve made up the word shinyverse, to refer to all the packages that either use or complement Shiny. This is a non-exhaustive list of shinyverse packages, mainly for my benefit when I inevitably forget, but if it’s useful for you too then that’s good too. shiny.semantic adds support for the Semantic UI library to Shiny. Useful if you want your Shiny apps to look a bit different or there’s something in the library that you need. shinyaframe doesn’t particularly sound like the kind of thing that everyone reading this will drop everything to do on a rainy weekend, but it’s awesome so it’s worth mentioning here. It allows you to use Mozilla A-Frame to create virtual reality visualisations with Shiny! shinycssloaders does very nice simple loading animations for while your Shiny application is thinking about how to draw an output. shinydashboard is so commonly used that I tend to think of it as what you might call “base-Shiny” (another terms I made up). If you’ve never made a Shiny dashboard I suggest you have a look. shinyWidgets is a lovely package that extends the number of widgets you can use. I’ve used the date picker in the past but there are plenty to choose from. shinythemes is another one that feels like base-Shiny. Change the appearance of you Shiny apps very easily by selecting one of several themes in the UI preamble. shinytest is for testing Shiny applications. shinymaterial allows you to use a UI design based on the Google Material look. shinyLP allows you to make a landing page for Shiny apps, either to give more information or to allow a user to select one of several applications. shinyFiles allows the user to navigate the file system on the server. bsplus allows you to add lots of things which are in Bootstrap but not in Shiny to your apps (and to RMarkdown, to boot). There must be other people out there doing this, so I’ll share this neat thing I found today. Quite often, you’ll have a dataset that has a lot of columns, only one of which will have something in it for each row. Survey Monkey, in particular, produces these kinds of sheets if you use branching logic. So if you work in one bit of the Trust, your team name will be found in one column, but if you branched elsewhere in the survey because you work somewhere else, it is in another column. Lots of columns, but each individual has only one non-missing element in each (because they only work in one place and only see that question once). In the past I’ve done hacky things with finding non missing elements in each column line by line and then gluing it all together. Well today I’ve got 24 columns so I wasn’t going to do it like that today. Sure enough, dplyr has a nice way of doing it, using coalesce. That’s it! It accepts vectors of the same length or, as in this case, a dataframe with !!! around it. Bang bang bang (as it’s pronounced) is like bang bang (!!) except it substitutes lots of things in one place instead of one thing in one place. So it’s like feeding coalesce a lot of vectors, which is what it wants. I really can’t believe it’s that simple. I went to a conference last week, more of a meet up really, and they presented the results of the work that we’ve all been doing, indicating that there were several statistically significant improvements in the expected direction. I’m sure the analysis is well intentioned and basically correct, so I didn’t really have any problem with it, but my arm shot up anyway, because I wanted to see more details of the analysis. The results were so good, I was just curious to see how they were so good really- what were the 95% confidence intervals, the sample sizes, alpha levels, just the nitty gritty of the analysis so I could really get all the detail of it. But they didn’t have it. They didn’t have much on the slides, and they hadn’t brought any supplementary materials. I don’t have a problem with that either. I think probably the reason why they didn’t is they don’t usually have stats wonks sitting at the back asking awkward questions. So they didn’t feel the need to be prepared. I cut my teeth (whille doing my PhD) at academic conferences. Asking awkward questions about statistical analyses is a spectator sport there. And I love it. Everyone’s a black hat, just waiting to crawl inside your work and blow it apart. It’s like a duel, like a competition. And of course that’s how science works. Everyone’s desperate to prove you wrong, and if you can stay at the top, then fair play to you. Probably something in it. There isn’t enough of that where I work, in the NHS. It really reinforced to me the need to keep going with what I’m doing. I want to train, face to face, everyone in my whole organisation who works with data. Two hours or fifteen, I want to equip them to ask awkward questions. And one day, I want to sit at the back of the room with my arms folded and watch a whole roomful of arms shoot up. “Increasingly, RStudio’s products are so good that I feel a lot of my advice to my organisation is “buy a lot of RStudio products”. I love RStudio (I have a tattoo of their logo on my arm, even!) and they clearly give a lot of stuff away (we used their products for nothing for *years*). But I wish I could at least acknowledge some competition in this arena. As far as I can see, if you want to develop a cutting edge data science team with R, it’s RStudio all the way. I’ve been thinking about it more and more over the last few days and I think my perspective has shifted because my role in my organisation has changed a little. For quite a long time I’ve been churning out Shiny code (and PHP/ MySQL) to run our patient experience data portal. But now I’ve zoomed out a bit and although I’m still doing that I’m working on a couple of other projects and have started to think about how we build our team- using Git, coding collaboratively, enforcing a code style. I’m starting to think about tools. Now I love RStudio. As I say in the tweet I have a tattoo of their logo on my arm. This is not a metaphor. An actual tattoo on my actual arm. But I’m starting to get concerned that I’m so focused on R and Shiny that I’m starting to miss the big picture. It’s my job to know about other approaches and to understand the benefits and drawbacks of each. Even if I end up saying “There are two other ways of doing this that don’t involve Shiny, but they’re both too difficult/ expensive/ unreliable/ whatever” then fine. But I just don’t feel comfortable advising my organisation without a wider view. So I’m going to veer off a bit, test the water. I feel sure this will involve Python, Jupyter, and whatever reactive type programming thing Python people use (see? I’m clueless). I know a bit of Python so it shouldn’t be too arduous. And I’ll poke around the rest of the space too. Julia. Other ways of interacting with R that don’t involve Shiny. As always, I’ll report back once I’ve made head or tail of it, which could be a while. This is a very simple example of using purrr and RMarkdown to produce several plots all at once. I’ve been sort of waiting until I understood this thoroughly, and I was going to write a very detailed blog post about it, and although I do understand it a lot better now than I did, I’m still not at the point where I would write an authoritative blog post about it confidently because there are too many things that I don’t understand. However, I’m aware that there are people out there right now who are trying to write dplyr code that takes strings as variable inputs, passed in from a Shiny interface, and I know how difficult it is to Google, because I Googled it myself. So I’m going to at least show you what to do, and talk a bit about it, and then maybe I’ll come back to it when I’ve understood it better myself. I’ve given the dataframe the name “input” to make it look like a Shiny application. So imagine your user clicks on “cty” in your app, which makes input$variable equal to “cty”. Now you just paste that together with a filter condition (“> 18”) and pass the whole thing to filter_(). Now your user perhaps sets the variable to “hwy”, and the calculation can be done with the new value. So (I think!) you’re saying to R- hey, listen, R, input is cty as a variable name. Wherever you see input, pretend it’s cty but as a variable name. This is called quoting. Then you have to unquote, using !!(). So you’re saying- that thing I mentioned about input being cty quoted? Well, I want it now, unquote input (using !! ()) and then use that variable name in the following. So now you can pass variable names from comboboxes in Shiny applications using dplyr. I’m sorry I don’t have the detail as nailed as I would like, I wouldn’t advice sitting any exams after reading this, but it should get you coding, at least, which is the first step. If the fog ever truly clears for me I promise I’ll come back and write more. I guess this is one of those where I kind of did know it was possible, really. If I’d thought it through. But I’ve always not been sure how easy it would be and I’ve been in too much of a rush. But there’s often a lot of text that I’m not sure everyone will be interested in. We collect a lot of comments and some people want every single one. Some people just want the tables. So it would be nice to be able to selectively show and hide the text in each section. There are lots so it's nice. To be able to hide them. That’s it. Boom. Done. If you’re not all doing that by the middle of next week then you need to be asking yourselves why.